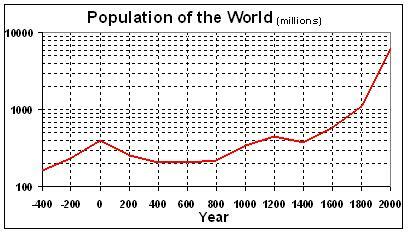 The population of the United States has passed the 300,000,000 mark. (See here.) John Tierney and Austin Bay (channeling Mark Steyn) explain why population growth is a good thing. I agree that it is. means more people to work “hard” and “smart”; more output that can be saved and invested; more inventors, innovators, and entrepreneurs whose activities can be leveraged into greater per-capita output; and a multiplication of opportunities for beneficial voluntary exchange. Estimates for -400 through 1800 are from U.S. Census Bureau, “Historical Estimates of World Population“; estimate for 2000 is from U.S. Census Bureau, “Total Midyear Population for the World: 1950-2050.” Year 1 is plotted as Year 0 for ease of illustration. “Upper” estimates are used for -400 through 1800 (where given) because those estimates are taken from a series that extends from -10000 through 1950, and the upper estimate for 1950 in that series agrees with the estimate for 1950 in the series for 1950-2050.